We played trivia at our local pub last night. We didn't win overall, but thanks to knowing that Don't Cha is by the Pussycat Dolls, I won this little gem. 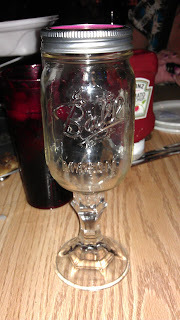 Ladies, and Gentlemen, that's a Redneck Wine Glass! ha! awesome! i bet it can hold a lot more than a regular wine glass...and that's what's important anyway! What a great - and completely appropriate - prize. So funny! Are you going to drink out of it? I surely would--just for the fun of it. You are such a lucky winner. I would use that all day and every meal! Love it.